Home / Columnists/ Mayday! Mayhem in the making? Mayday! Mayhem in the making? By the time you read this, you would have perused many pieces, no doubt, on the precarious state of the nation of late. The painful memories of April-May – Meethotamulla pitfall and the proposed appointment of a military panjandrum to curb, inter alia, a rising spate of civil unrest in our country, among other imbroglios – have been overshadowed by more recent events of alarming proportions. With that said, the calibre and ethos of the egregious Cabinet shuffle cannot pass without comment – even from the ranks of Tuscany. “Size matters,” as the actress said to the bishop, but I’m not going to mention that… it’s obvious that these jumbo cabinets are here to stay for good… or for bad, or for ugly, and for worse – no matter what taxpayers say or critics carp about, quite rightly. “Size might hurt you,” as the bishop said to the actress – and if you had watched a certain media channel’s reportage on it, and caught its group media director’s social media comment on it, you’d agree with him about the need to justify jumbo cabinets’ tax-money-spend. Carp and cavil we can or must, citizens! The channel caught Cabinet ministers arriving at the Presidential Secretariat earlier this week… ahead of the Cabinet’s most recent attempt at musical chairs – and that senior journalist’s comments spoke volumes about the ongoing egregious spend of our monies: “You will be shocked to see how our politicians arrived this morning at the Presidential Secretariat for the reshuffle. Rising cost of living? Clearly not for these guys…” – The price tag on the ministerial vehicles ranged from the ‘lower-end’ Audi Q7s and Porsche Cayenne Ss (price-tag: Rs. 22 million apiece), through the 2013 Toyota Landcruiser valued at a ‘mere’ Rs. 27 million (someone’s minding the austerity budget, maybe), to the upper-echelon Mercedes S-Class and Benz GLS 400 SUV (both Rs. 35 million) right up to several BMW 7 Series super-luxury cars (Rs. 38 million apiece), and even a 2017 Toyota Landcruiser valued at a cool 40-million smackers. Time’s also way past for more than sundry denizens of some deep dark corner of the web, posting poignant cavils about the depths to which we’ve sunk again, to wake up and smell the odour of burning napalm in the morning – and the stench of Good Governance’s credibility going up in smoke. The previous regime, which our incumbents ousted with our help (which they seem to have forgotten), was bad enough – with its strongman’s “alleged” bribing of 17 then opposition MPs to crossover ahead of the spurious release of his dastardly ‘corruption files’ – It was a Machiavellian move that forever transmogrified the strongly bipartisan polity which we had once enjoyed, warts and all, up to that watershed. But now we have to hear how the Rajapaksas & Co. sequestered an irrecoverable Rs. 18 billion (or is it 1.8 b, God only knows) in Sri Lankan assets while the powers that be seem keen to prove the maxim that imitation is the sincerest form of flattery. And what do we have to show for it except Ravi and Mangala swopping (no pun intended, I meant portfolios) and sundry mandarins cursorily shifted around at the President’s pleasure – or is it the Prime Minister’s men we’re seeing get the plum posts again? Of course, in an extended profile of portfolios which embraces a Minister for State Assets and an entirely separate Minister for National Assets (to say nothing of sub-ministries for strategic development, development assignments, and special development assignments, or some such-like), there is hardly any pleasure for the people – Only pain… at how the whole kit and caboodle of Government continues on its merry caravan-like way, at the performers’ pleasure, theirs, until we get to vote next… I’m not holding my breath – for ‘We The People’ have demonstrated an incredible penchant for being gulled again and again, and incredulously pontificating on how “the more things change the more they remain the same…” grumble, grouse, par for the course! Once upon a time, in the fairy-tale republic of never-was-Ceylon, newspapers would suffice to clue one in. Today, and yesterday for a decade or so, the state of the not-quite-Democratic so-nasty-Socialist neo-pseudo-Republic of Sri Lanka is demonstrably reflected by denizens posting on social media. (Let’s leave the ‘kos polos’ out, for the nonce). #1 Dancing the merry devil: Take the recent Cabinet cabaret act. Said one media-savvy commentator in a post depicting three emoticons remaining mum: “Masters at musical chairs, aren’t we?” The monkeys did not play stumm, eschewing emulating the ‘see no evil, hear no evil, speak no evil’ attitude of their peers from Hambantota to Havelock Town to Horowpotana who are not on Facebook. “New seats. Old shuffle technique. Jokers in the pack remain the same…” – quipped one orang-utan. To which another beautiful baboon responded: “Yes, and the genre for the game of musical chairs is ‘kolam’. The end game is to b*gger the nation.” Yet another aped the conventional wisdom by adding: “Giving everyone a fair chance to await their turn to make their fortune.” Well, I’ll be a monkey’s uncle! Problem is: no one – neither State, nor law enforcement, nor civil society, not even those justices of the peace – has had the courage of their convictions to supply the coup de grace or administer a quietus to this meddlesome monk… Spewing vitriol and inciting violent activism should have brought the full justification of the ICCPR Act, inter alia, no new laws needed, down upon and against him – but he remains disturbingly at large: Public Enemy and Menace No. 1 in my book… Supposedly supported by the scurrilous Head of State keen to wear the laurels of executive power, inflamed by his own rhetoric (which, regrettably is effective and rousing), inveigled by hidden hands – those old iron fists in velvet gloves Who Won the War for us – with not so secret agendas. 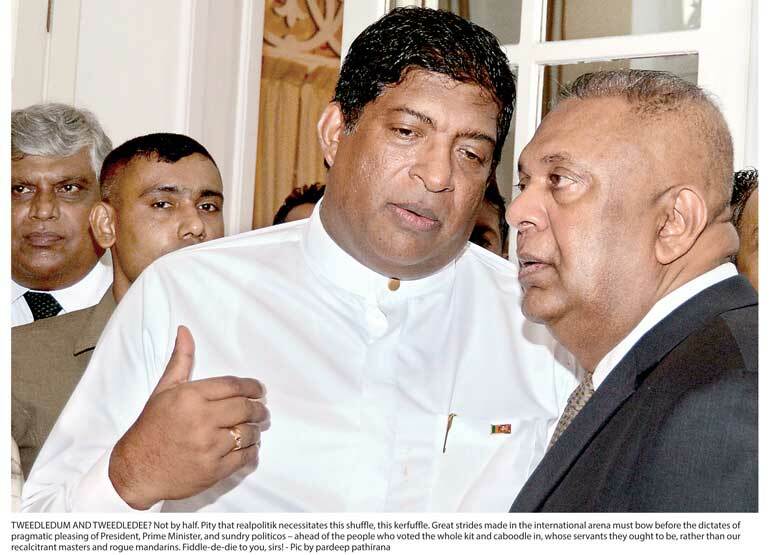 The old news that former Army Commander Sarath Fonseka – then Lt. Gen. now Field Marshal – is to take on the mantle of military supremo has already evoked mixed reactions in town hall and marketplace. There are those who feel that in a country still badly riven by Protests, Trade-union agitation, Strikes, Demonstrations (a PTSD of sorts…), a man of such calibre would be a panacea militating in favour of productivity, order, efficiency. Then there are those others who display signs of PTSD (Post-Traumatic Stress Disorder) – confusion, terror, schizotypal-personality characteristics – at the prospect of precisely a man of such calibre in exactly such office; and then again there are others for whom it is a Pleasure, Triumph, Satisfaction, Delight. There is much to be said on both sides, and much has been said ad infinitum in print and electronic media, as well as ad nauseam on social media, in the past weeks. The legality, advisability, timing, ramifications, intentions, necessity, efficacy, of such an appointment have been discussed and debated until people are blue at heart – and the person under scrutiny probably red in a part corresponding to the public face of Might Is Right. Then there are those who prudently remember that ‘might is right’ under a military junta of sorts in the past as much as a republican democracy of late … and prudently button their lip – to the dismay of dissenters and the detriment of critical engagement of Government by civil society. Then again there are cases, causes, concerns, which will simply not go away… no matter how much even Good Governance wishes these would go away… and not make a nuisance of themselves on the eve of important events (Mayday gone by) and movements (constitutional reform to come) in our Democratic Socialist Republic. There are the pending cases of missing pressmen in particular, some of which place something of a Damocles’ Sword Regardant (i.e. looking back over the lion’s shoulder) over the much lionised previous regime. The finger of suspicion still points to the panthers who feasted on prey now largely disregarded as cannon-fodder and collateral damage as considered customary or par for the course in a debilitating civil war such as ours. The tough-minded still ask questions suggesting strongly that justice be done … adding that our hard-won Peace would be significant if – and only if and when – Justice is seen to be done … for the fruits of Peace with Justice to taste not only ready, but ripe, and be richly nourishing to all citizens – without exception – for whom the war was fought and won; “zero civilian casualties”, “war heroes”, expendable civilians, scribes, gadfly editors and cartoonists, and all. Q: Is it moral that Might Is Right in a peacetime republic? A: Not if the coalition administration wishes posterity to hallow its contribution as Good Governance rather than a strangely familiar incarnation of Mahinda’s Regime. Not if it is serious about the mandate for a sea-change that WTP gave it! Q: Is it ethical to employ the military in a movement meant to deploy State resources to effect the transformation of a post-war culture into a post-conflict society? A: Not if Sri Lanka is to avoid going down the road of Myanmar or Turkey. Not if the champions of a just peace truly believe the hype and hoopla they’ve cheerfully spun in parliament and sundry podiums, spreading sunshine stories and garnering a sense of peace with justice. Q: Is it significant that in a spiritually savvy society such as ours, a new troika of elected politico, appointed military supremo, and self-appointed firebrand ethno-chauvinist is coalescing as the three new wings of Government? I’m just asking the three questions above with no intent to malign or slander – rather, hoping against diminishing hope that I’m wrong in my suspicion that Sri Lanka’s ethno-military-political malaise is not a managed spectacle of powerful parties with an axe to grind and vested interests. Trust – like others of my ilk before – I won’t end up battered and bruised and dumped by the roadside wounded and bleeding; or worse, beaten brutally and dumped as dead by the Diyawanna – for my pains. Shame be on him who thinks evil of it: that in times of peace we’re still seeking to beat our ploughshares into swords; and not the other way around, as any Dharmishta Samaajaya and/or Chinthanaya touting society worth its salt would do. What responses can We The People (WTP) essay? Remain critically engaged, as some senior journalists (vide Namini Wijesdasa in sister print channels and social media) have taken it upon themselves. Where art thou, civil society/business chambers/professionals and academics, today? Respect dissent, difference, debate, dialogue. Extremists must not be allowed to dominate the headlines time and again, so shamefully as they do! Stop reporting them as if they were some superheroes wearing their underwear – like their underhand ideas and methods – on the outside. Relegate ‘war heroes’ with a Damocles’ sword of suspicion over their own heads to the backburner. Stop lionising suspect politicos!